DARLINGTON FRESHMAN Carter Lancaster (#8) comes home for the go-ahead run as the Redbirds defeated Cuba City, 5-4, in a WIAA Division 4 playoff game. 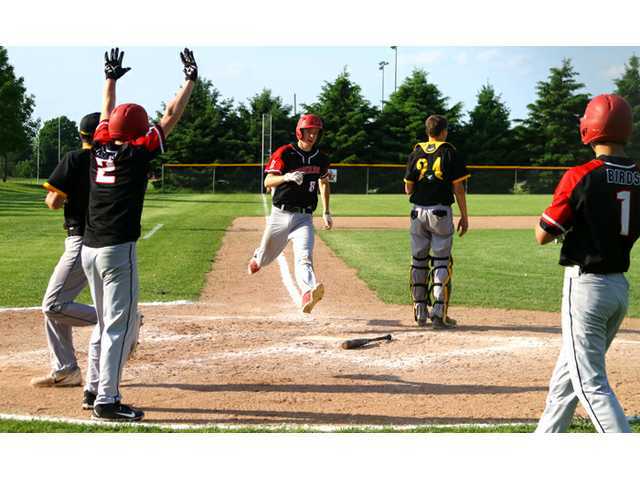 POSTED May 31, 2018 10:42 a.m.
DARLINGTON – Darlington turned a game-ending double play to shave off a seventh-inning rally by Cuba City as the #8-seeded Redbirds held on to defeat the #9-seeded Cubans, 5-4, in a WIAA Division 3 regional quarterfinal baseball game played at Otto Ruf Field on Thursday, May 24. Darlington held a one-run lead going into the final frame, but that lead appeared to be in jeopardy after Cuba City pitcher Riley Richard opened the seventh with a single to put the tying run on base. Dylan Timmerman, who had hit a two-run home run earlier in the game, stepped to the plate and tried to advance Richard into scoring position on a hit-and-run play. However, after swinging through the pitch, Timmerman’s bat made contact with catcher Bailey McGuire, who was attempting to throw out Richard. Timmerman was called out on the play, and Richard was sent back to first base. Seth Kunkel followed with a screaming double down the right field line, but Richard– starting from first– had to be held up at third base on the play. Darlington moved in their infielders in an attempt to keep Richard from scoring the tying run. Cuba’s next batter, Brandon Brogley, hit a sharp line-drive that was caught just off the ground by shortstop Nick Andrae and he tossed the ball over to third to double up Richard, who had broken for home on the crack of the bat, to end the game. The Redbirds (6-13 overall) grabbed an early 2-0 lead after plating single runs in the first and second inning. McGuire belted a solo home run to left to put the ‘Birds on the scoreboard, and outfielder Kolbe Ubersox doubled home DH Thomas Wessel to extend the lead to 2-0. The lead remained stuck there until the top of the fifth inning when the Cubans (3-16) struck for four runs to overtake the ‘Birds. Darlington struck right back for three runs of their own in the bottom of the fifth inning to regain a 5-4 lead. Second baseman Carter Lancaster singled in Ubersox to cut the deficit to a run, and then starting pitcher Preston Banfield helped his own cause by lining a two-out, two-run single to put the hosts back into the lead to stay. The Cubans put two runners on base in the sixth inning and two more on in the seventh, but couldn’t push across a run against Redbird reliever Barry Schliem as their season came to an end with a 5-4 loss. Banfield (3-6) earned the win after working five innings and giving up four runs on five hits and three walks with four strikeouts. Schliem notched the save, tossing two scoreless innings and fanning two batters. At the plate, Ubersox finished 2-for-3 with a run and a RBI. McGuire and Lancaster each drove in a run and scored a run for the ‘Birds. “This time of year you just try to play as long as you can, so we’re happy to be able to practice and play again,” Solberg said. Leading Hitters: CC– Riley Richard 2x4, Seth Kunkel 2x4. HR- Dylan Timmerman, Kunkel. 2B- Justin Hasken, Kunkel. D– Kolbe Ubersox 2x3. HR- Bailey McGuire. 2B- Ubersox. W- Preston Banfield (5IP, 5H, 4R, 4ER, 4K, 3BB). L- Richard (6IP, 5H, 5R, 1ER, 4K, 1BB). W- Barry Schliem (2IP, 4H, 0R, 0ER, 2K, 0BB). Leading Hitters: S– Redfearn 2x3, Schneider 2x4. 2R- Redfearn. D– Bailey McGuire 2x4. 2B- Nick Andrae. W- Splinter (3IP, 4H, 2R, 2ER, 0K, 0BB). L- Preston Banfield (2IP, 1H, 1R, 1ER, 5K, 0BB).